Our hotel-restaurant is an official wedding location for the town of Ermelo since October 2013. “De Zwarte Boer” offers you the perfect opportunity to share your vows, organise your reception, dinner, sparkling evening filled celebration and afterward staying in our exclusive “Sandberg van Leuvenum” Suite. The next morning you can enjoy our served breakfast with a glass of bubbles on the time of your own preference. In short.. your complete wedding day under the same roof! Nowadays the old “Deel” is our intimate room space with a capacity of 55 guests. The room has its own bar and route towards our parking lot. 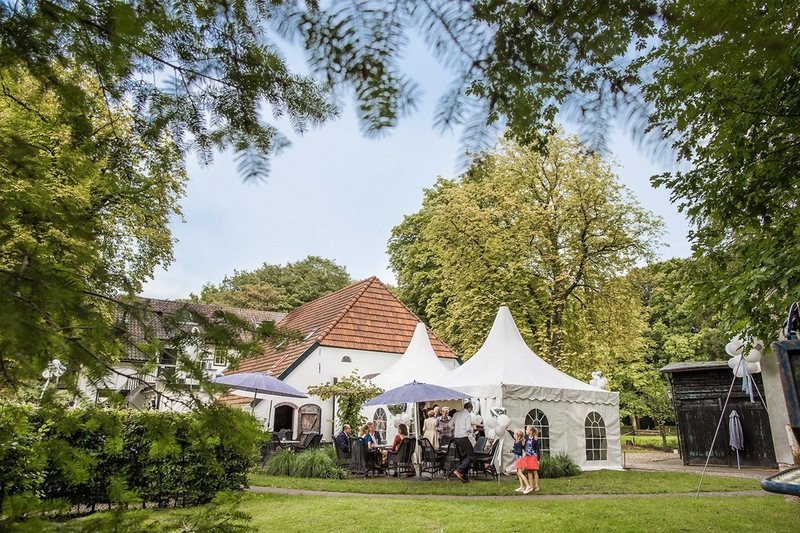 When the weather permits, you also can use our beautiful “Druiventerras” which is romantically lighted in the evening with old lanterns, ground lighting and fire flames. This all in the middle of the forests of the Leuvenum estate! “Oude Huis te Leuvenum”. This old manor, which stood in the forests behind our hotel, is demolished in 1854. Our “Deel” was built in 1855 with the bricks that were released during this demolition. A wonderful part in history that is connected to “De Zwarte Boer”! When you are searching for a proper location for you intimate dinner, high tea, reception or fairylike weddingparty we would like to make an appointment with you. We proudly give you a tour through our location with ancient history and discuss our possibilities and your wishes. If you would like to book our hotel-restaurant exclusively, we can organise occasions up to 150 guests. 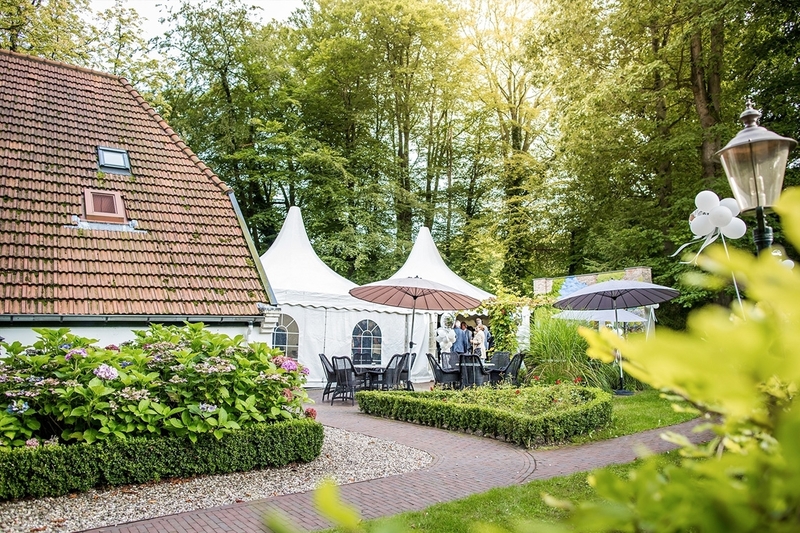 We also offer the opportunity to hire event pavilions which will be placed on our “Druiventerras”. This gives us the opportunity to increase our capacity up to 200 guests. We are proud to welcome you! For reservations and further information you can reach our hotel-restaurant directly at +31 577 407395.